What is the piriformis muscle and what function does it serve? These are questions that we commonly receive and are happy to answer for you during the course of this focused article. After all, this website is 100% dedicated to educating readers about the diversity of piriformis pain syndromes. We do not cover any other topic. Without a thorough understanding of the piriformis muscle and its purpose, patients can not progress to truly discover why they have pain or how to effectively treat their suffering. While it is not crucial to understand the complex anatomy, innervation and functionality of the piriformis to the same degree as your doctor might, it is still recommended to have a basic understanding on the fundamental facts of the tissue and how these truths might help you to end your pain. This dialog provides explanations for some important questions that affect piriformis syndrome sufferers. We will cover the basic design and purpose of the piriformis muscle in order to provide a solid background base of knowledge to help patients to better advocate for themselves in the confusing chronic pain therapy sector. What is the Piriformis Muscle Exactly? The piriformis muscle is part of the lateral rotator group of tissues that resides deep in the anatomy of the buttocks, near the SI joint, hip and pelvic regions. The muscle is attached to the sacral spine, as well as to the head of the femur, which is the upper leg bone which joins into the hip socket. Much of the piriformis muscle resides within the confines of the pelvis and is sometimes implicated in being involved in pelvic pain syndromes, as well. Doctors describe the piriformis in different ways, including triangular, pear shaped, wedge-shaped or trapezoidal. The muscle is basically a flat tissue that assumes a definite shape when viewed from a specific angle. The tissue and its attaching tendons are considered to be very strong, which is important given their incredibly important functionality. Approximately 17% of the total population of adults demonstrates abnormalities of typical piriformis placement in relation to the sciatic nerve within the anatomy. Normally, the sciatic nerve passes under the muscle, but in some cases, the nerve can pass in front of the muscle or through the substance of the muscle. In other cases, the sciatic nerve can divide and encircle the muscle, as well as passing parts of the nerve through the muscle. There are several distinct designations of sciatic nerve placement abnormality that can be diagnosed in relation to the piriformis muscle tissue. What is the Piriformis Muscle and What Does it Do? The piriformis muscle is crucial for providing the ability to ambulate as we humans take for granted. In fact, if it were not for the piriformis muscle, and the other muscles of the lateral rotator group, our upright posture would be highly unstable, our gait would be awkward and our current human physical capabilities might be completely impossible from a scientific point of view. When it comes to actual functionality, the piriformis muscle regulates the movement of the femur bone in relation to extension and/or flexion of the hip. What this action translates to is the ability for an upright human to easily and automatically shift their weight from side to side as they walk. This ability provides balance and stability to our upright mobile posture and stride. What is the Piriformis Muscle and Why is it Painful? People who demonstrate sciatic nerve placement abnormalities in relation to the piriformis muscle tend to be diagnosed with piriformis syndrome more often than people who do not demonstrate these structural variations. However, there remains much debate about whether the abnormality is actually contributory to the pain or simply used as a scapegoat to provide some credibility for what would otherwise be a completely speculative and subjective diagnosis. Athletic individuals tend to be diagnosed more often than sedentary individuals, often using injury or RSI as modes for why pain is occurring. Although not common diagnosed in the traditional medical sector, true causation of pain in many people is the mindbody process. The piriformis interacts directly with the sciatic nerve and can therefore be easily contracted, causing the sciatic nerve to suffer marked compression and pseudo-sciatica symptomology. We have proven the existence of this phenomenon through our research into the use of knowledge therapy to undermine such psychogenic syndromes and provide a cure without any medical care whatsoever. In fact, this mindbody approach to care is one of most effective for all manner of piriformis pain diagnoses. Piriformis Pain > What is Piriformis Syndrome? 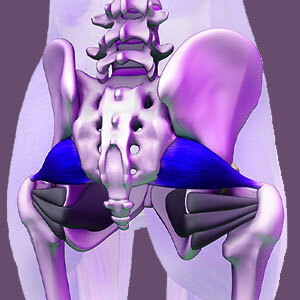 > What is the Piriformis Muscle?